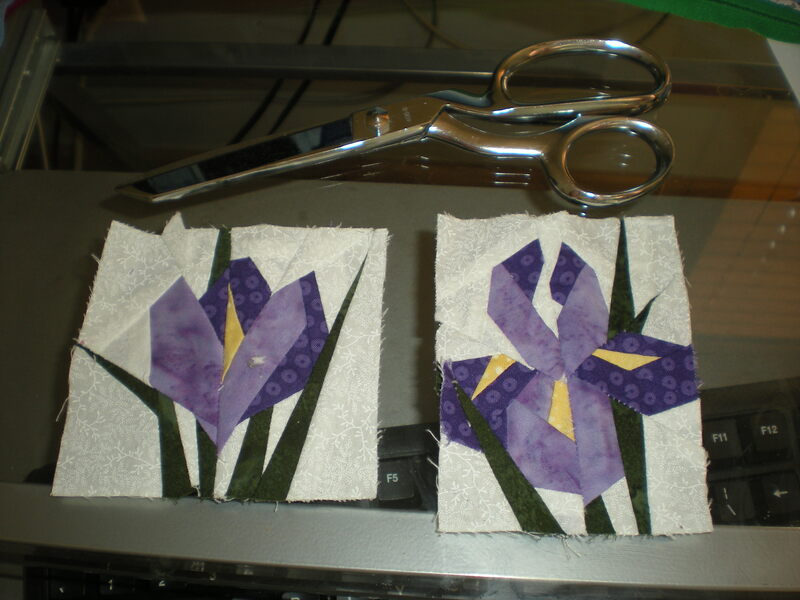 I made these irises a long time ago and have never done anything with them. They are really small. One is 3x4 and one is 4x4. I need ideas for finishes. I thought about small bags, but you guys have such great ideas, I wanted to ask if anyone has any other thoughts. Thanks for your help! Mug rugs, pin cushions, sampler quilt? I would put both in a wallhanging, one on top of the other. I would use them for outside pockets on a bag or tote. Or maybe a mug rug. That was my 1st thought. I'm a flower person. I have a book called Fantasy Flowers that has PP flowers if I rember correctly. Put them on a bag or cover for your Ipad it laptop? How about a thread catcher at your sewing machine or a sewing machine cover accent? How about finishing one for a little wall hanging for the bathroom? I put left over blocks on the backs of quilts or use as labels. I would try shadow box , It would make a pretty wall hanging & your Irises would look like they are floating. This was my first pp pattern I took in a class. I only made one! This pic is several years old but shows the borders. Beautiful, irises are my favorite. Whatever you do with them will be lovely. These sound like good ideas. Pot holders too! Personally, I think they're way too pretty for a label or bag, etc. How about adding some sashing rows of HST's or something like that and make a wallhanging?? Thanks for the great ideas. Now I have to decide!! How about a six inch bell pull style wall hanging. Put a couple pieced blocks above , a plain background square between and a couple pieced blocks below. Use colors from the irises. I'd put these in a vest. I've used Carol Doak's vest books, and love doing them.